Plate 17 from the first set of Thomas Daniell's 'Oriental Scenery.' The Khusrau Bagh in Allahabad had originally been built as a pleasure resort for the future Emperor Jahangir (1605-27), then Prince Salim, when he stayed here in 1599 when in rebellion against his father. Jahangir's eldest son, Khusrau, in turn rebelled against his father, and was blinded and kept incarcerated in this garden in Allahabad. He died in 1615, but his tomb was not completed until 1622. 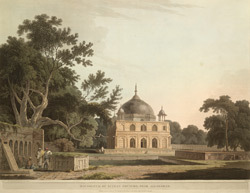 Unlike most Mughal tombs of this type, it lacks a big arched portal on each side, but has instead two rows of superimposed niches, giving the impression of two storeys.